The Republic of the United States of America has been compared to that grain of mustard seed, which when planted in the earth budded forth and grew into such dimensions that the birds of the air lodged under the branches thereof. I pray that the shadow of those branches be extended over my bleeding nation. 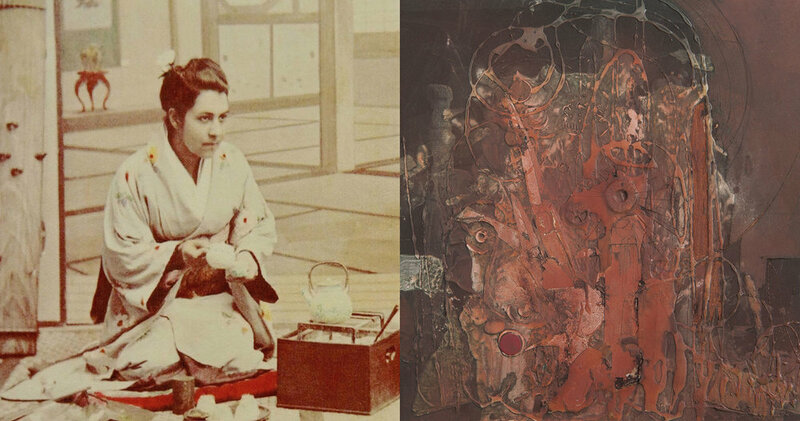 The Armenian Museum presents a new exhibition in the Adele & Haig Der Manuelian galleries that explores the intertwined lives of diplomat Diana Agabeg Apcar (1859–1937) and artist Berjouhi Kailian (1914–2014). In 1919, history connected these two women in Yokohama, Japan. As refugees from the Armenian Genocide, Berj and her mother found themselves in the shadow of Diana’s sturdy branches as she helped them find their way to a new home in the United States. Berj’s creative life flourished for 95 more years because of Diana’s compassion. The Museum’s recent acquisition of Berj Kailian’s work includes mixed media paintings on wood panels that seem to come from the earth—the thick layers are gouged, chiseled, and marked as part of a physical process “to release the hurt”. Suppressed loss emerges through to the surfaces with recurring imagery of lost architecture to convey the frenzy of looking for the siblings she will never find. Together, their work intermingles at the Armenian Museum in Watertown, MA to bring context and connection to each of their substantial contributions to Armenian and Armenian-American experience. This exhibition will open on April 24, 2019 in recognition of Armenian Genocide Remembrance Day. The Armenian Museum wishes to engage in meaningful dialogue around this solemn subject that permeates Armenian experience around the world. Join us from 6–8:30 pm for a candlelight viewing of the galleries followed by a discussion of the traumatic effects of the Genocide to remember the victims, survivors, and individuals who chose to intervene.